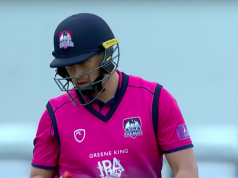 A little over a year ago, Derbyshire County Cricket Club made a signing that got a lot of Derbyshire Cricket fans excited and made a lot of people in the cricket world to sit up and take notice. It was the signing of the extremely talented Shiv Thakor, the young all rounder widely recognised as one of the hottest prospects on the county scene, joined from Leicestershire at the end of the 2014 season. Thakor’s first season at the 3aaa County Ground was a frustrating one, for the fans and most importantly for him. Still hampered by a finger injury that effected his final season at Leicestershire, Thakor was limited to 12 First Class appearances, scoring 349 runs, averaging 21.81 and taking 13 wickets at a touch over 51. This season has been different, however, and he says that’s down to lots of little things: “It’s been another winter’s hard work,” he said, “I’ve missed a couple of years through my finger injury; it set me back a little bit. “I’ve just tried to have a really good winter, work as hard as I can, simplify things, go back to what works, modifying small bits here and there. “Gone well” is an understatement for Thakor, having already scored 399 runs at 83 and taken 17 wickets at 25 runs per piece in just 6 First Class appearances so far this season. It is important for Thakor to keep these impressive figures going. 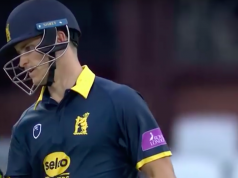 Derbyshire currently have a burgeoning crop of young allrounders in Alex Hughes, Greg Cork and Tom Milnes, who signed from Warwickshire over the Winter, who are all able to do a similar role to Thakor. This competition is a great thing for the club and for Thakor himself, which is something he recognises:”Competition is always healthy for both, personally and for the whole team. In some cases competition can cause friction in a squad, but it was clear from talking to Thakor that this is not the case at Derbyshire currently. He was keen to point out that it is a good place to be and play cricket: “It’s a brilliant environment to be a part of,” he said “The club’s going in the right direction, both on and off the field. “We are quite a young group of guys, everyone gets on very well, were all very good friends both on and off the field. Winning games has been a struggle for Derbyshire in First Class cricket this season, although it has proved easier in the white ball game. If the wins do come then it will go a long way toward Thakor and the side achieving their aim this season: to win silverware. It’s something about which he spoke very passionately: “it’s the ultimate aim to win silverware, to win trophies and bring trophies back to the club. Thakor has represented England through the age groups, and captained the under 19s, so with his impressive form at the start of the season, one wonders if England recognition is something that is on his mind. “I’d love to get back playing for England!” He says, “I was lucky enough to represent the age groups, obviously something I want to do is to play at the highest level. 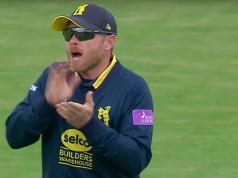 “I’m fully aware that’s something that is only going to happen through performance, and helping Derbyshire win games, scoring my runs, taking my wickets and catching my catches. “I just need to be as consistent as I can and hopefully other things will take care of themselves.” Thakor said. England could do a lot worse than to cast their eye over this impressive young man, who has an old head on some very talented young shoulders. “I have to know that come the next game I’m nought for nought when I come to bowl, and nought not out when I come to bat, so everything starts from zero. Clearly, he’s not letting his success go to his head. He’s staying very grounded and focused on doing well for Derbyshire, something his team mates, coaches and fans will be hoping he does for the rest of the season. If he does continue as he has started the season, then England may well come knocking for Shiv Thakor.